Adoption at the Movies : Max: Too much violence, not enough love. Max: Too much violence, not enough love. 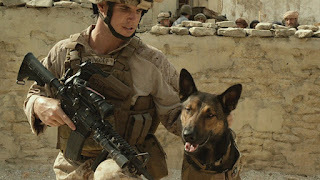 Max is a highly trained dog who serves alongside Marines in Afghanistan. He is particularly dedicated to his handler, Kyle Wincott. Kyle comes from a military family – his father Ray is an esteemed hero of a previous war. Kyle’s unit is being investigated for possible involvement in arms dealing, and Kyle comes to suspect that his friend and fellow Marine Tyler is involved. Shortly after talking to Tyler about this, Kyle is killed after an unknown assailant triggers an explosion. Now, Tyler has returned to Texas and has obtained work with Kyle’s father, who owns a storage facility. Max is traumatized by the loss of Kyle, but finds himself comfortable around Kyle’s younger brother, Justin. Ray and Justin both try to make peace with Kyle’s loss in their own ways, and Justin’s peace comes in part from his relationship with Kyle’s dog. However, when Tyler tells Ray that Max was responsible for Kyle’s death, Ray decides that it’s time for Max to go. Max, Justin, mother Pamela, and Ray all experience the loss of a loved one. 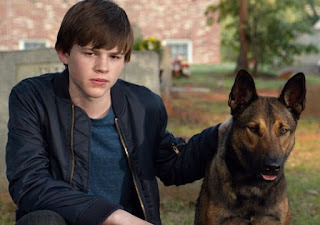 Although Max is a dog, his experience of loss might most closely resonate with some adoptees, especially viewers adopted from foster care – due to a violent situation, and with the influence of dishonest adults, he was taken away from someone he loved and trusted, and put into a tenuous relationship with new people in an unfamiliar space, threatened with the prospect of being sent away (or in Max’s case, euthanized), if he misbehaves. Max is also used as a scapegoat by adults – just as sometimes families place blame unfairly upon foster children because they don’t suspect their own children. Many children in foster care are diagnosed with PTSD. Max seems to have a canine version of PTSD. Adult viewers could find Max to be a helpful illustration of how trauma can impact psychology and behavior. though he isn’t good at showing it. Justin, in his anger, blames Ray for Kyle’s death, telling him that if Kyle wasn’t trying to impress his father, he wouldn’t be dead. Ray’s distance, critical nature, and inability to express emotions towards his son were uncomfortable to watch. There’s a lot of gun violence. Kyle was betrayed by Tyler. Tyler then threatens to kill Justin, and suggests that Justin’s parents won’t be safe, either. It could be very hard for young kids to see an armed authority figure be so untrustworthy. 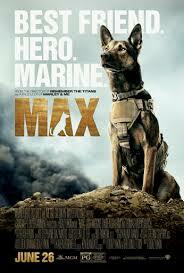 Although a movie about a dog seems to be custom-made to appeal to kids, Max is too violent for most young viewers. Combat scenes are loud, but expected, but there’s even more personal violence after the war, where a trust adult threaten to kill a child and everyone he loves. This one’s probably best left to later teens, but it doesn’t seem particularly likely to appeal to them, either. Some other animal-centric movies that are more kid-friendly include: Paddington, Penguins of Madagascar, and Chimpanzee. A film with some positive father-son interactions that’s more kid-friendly is The Boxtrolls. Losses can divide families or draw them closer together. What makes the difference? What made the difference for Justin’s family? How does understanding what Max has been through help you understand his behaviors? How does it impact your assessment of him?